Give It Some More Cheese, Please! Mom is an excellent cook. She is the original reason why I fell in love with the lady-par-excellence of the Italian food universe: pasta. 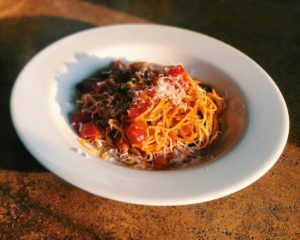 Her very classic spaghetti with napolitana sauce, pepper, and tons of freshly grated Parmesan is my favorite dish by far. Not even Colombian arepas* can compare to it: betrayal! Pasta, to me, is the queen of all foods. It’s simple, tasty, inexpensive, and easy to prepare. Not that I know how to. I envision this queen in a Roman café, by the Trevi fountain, reading a newspaper and having a hot chocolate, or walking the streets of New York with very comfortable shoes, a white t-shirt, and jeans. Pasta is a bit like that in my mind: comfortable, safe, and solid. A friend you can always trust and who will never judge you. I am so passionate about it, that I started doing some research: pastas have different names, many based on the different shapes the dough is molded into. Each type has its own characteristics and personality. Exactly like people: long and short, thicker and thinner, serious and funny. All pastas are created equal, and are all different at the same time, each one with its own peculiarities. There is spaghetti, bigoli, ravioli, ziti, cappelletti, trofie, bucatini, pennette…there is even a pasta called “cavatappi,” or corkscrew. And I am not joking! If I were a pasta… I´d like to be spaghetti or ravioli or fusilli or…I can´t decide! For sure, I would be a pasta fully covered in cheese. So much so that you can´t even see the pasta underneath. Exactly how I like it! By the way, pasta was born poor. Did you know that? In a famous scene from the movie “Poverty & Nobility” by Mario Mattoli (1954), a huge dish of sauced spaghetti is revealed right in the middle of the table, and the people sitting around it—two poor Italian families from the South—eat everything they can until they can’t take it anymore…at which point they stuff their pockets with it in order not to leave anything behind. You see, I have an almost emotional attachment to pasta, possibly because it has “saved” me twice already. First there was Germany, the country of pretzels, bratwurst, and schnitzel. I was only sixteen and I was living in a small town near Frankfurt thanks to my school exchange program. 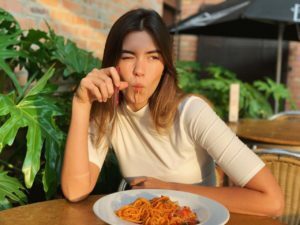 I was having a hard time familiarizing myself with the local food and my exchange family, of Italian origin, was cooking me pasta almost every day. It was a dream. And then there was New York City. 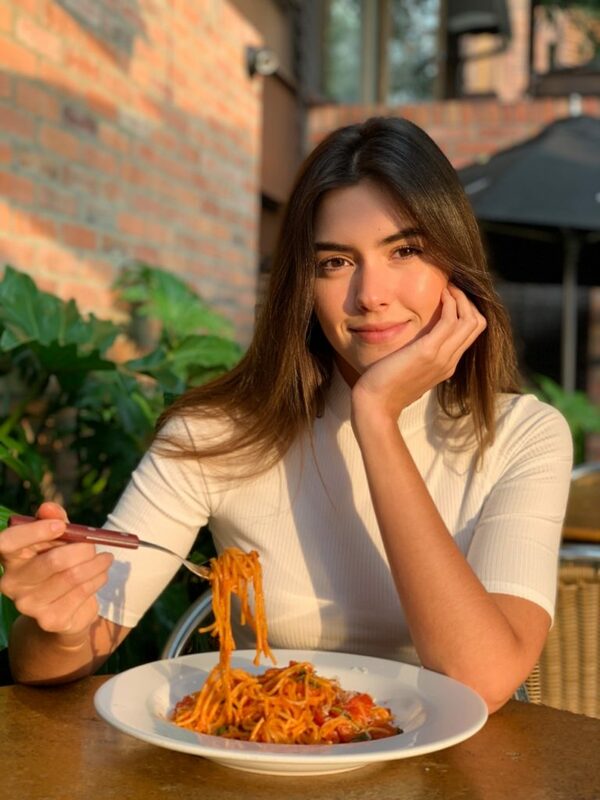 I was new in town, right after being elected Miss Universe, with no time to thoroughly explore the food scene and no one to give me restaurant recommendations…until I found a small Italian trattoria right across from my apartment, lucky me! I started eating there twice a day. Ah, those Italians, they certainly know how to make pasta. Now let me tell you a little secret: over time, I might have become an “expert” in pasta, but guess what? I haven’t been to Italy yet! Which calls for a trip there very, very soon. Could you imagine how much my knowledge and taste level would improve after having “the real” stuff? I am so ready. Italy, here I am! I am not sure where I would start. Any recommendations? * One of the most popular foods in Colombia, Arepas are delicious cake, usually made from corn or yucca (although they can also be prepared with other ingredients).To eat them, different types of fillings or toppings are used, such as cheese, proteins, vegetables, and many more. PREVIOUS “Me” Time in the Clouds!